When I was growing up, I played the piano, although I was terrible at it and put in little effort to improve. In school, I learned the trombone and the trumpet through the band program, which I think I was a bit more successful at. However, I also picked up a few instruments on my own, including the electric bass, the ukulele, and the cello. I have been asked several times in the past about the instruments I started with and often I do not have a very good answer. For the electric bass, this was something my dad played before my time and he wanted me to try it out. I am no expert at it, but I enjoy jamming along. As for the ukulele, it was an instrument I wanted to learn since elementary, but for some reason it was skipped in our school curriculum. I really wanted to learn it, so I taught myself over the winter break when I had my wisdom teeth extracted. Once again, there are a lot of things I know I can learn with both of my current instruments, but it was more important for me to take the first step to try something new. It seems GAMDIAS has followed this advice, as today we can see them getting into power supplies for the first time. Following CES 2018, where they announced quite a few products that were not peripherals, they have finally made good on their new venture, releasing the ASTRAPE P1-750G 750W as part of their power supply lineup. These units are not the easiest market to dive into, so let us see how they do in today's report! Today's review unit of the GAMDIAS ASTRAPE P1-750G 750W hails from Markham, Ontario. 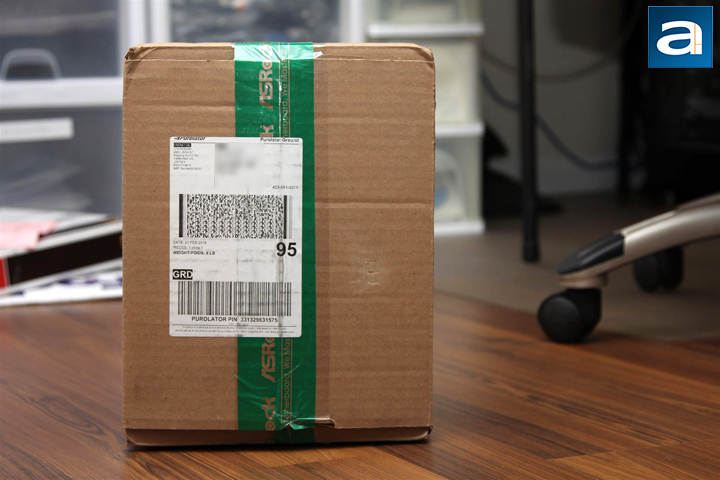 Traveling with Purolator and their ground service, this box arrived with a few bruises on the edges, but it is nothing to be concerned about. Interestingly enough, it was sealed with ASRock tape. Otherwise, there is not a whole lot more to speak about, so I opened up the box to get to the power supply. 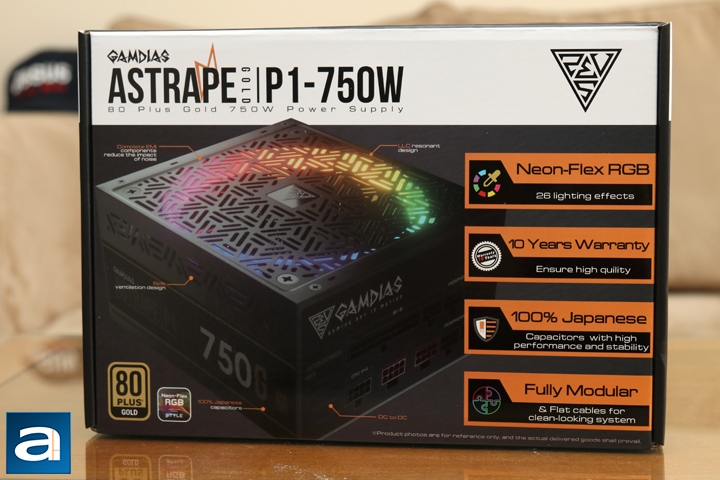 The retail packaging of the ASTRAPE P1-750G 750W falls in line with previous GAMDIAS products with a predominantly black box, followed by some white panels and orange accents. The power supply itself is situated on the front panel in plain sight. The product's name and description is printed at the top. Several main selling points about this power supply are listed on the right side, including RGB lighting effects, ten year warranty, 100% Japanese capacitors, and a fully modular unit. On the side there are more features and specifications of the power supply. Otherwise, there is not much else to look at besides a noticeable typo on the box. 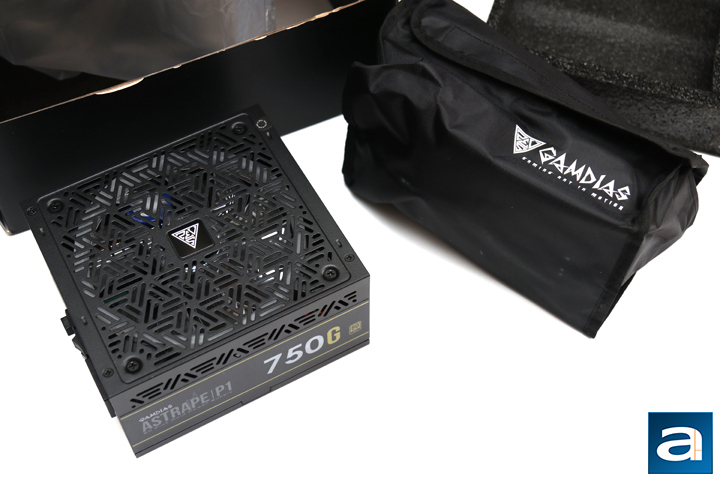 Out of the box, the GAMDIAS ASTRAPE P1-750G 750W is sandwiched between two foam brackets and wrapped by a translucent plastic bag. Some parts of the power supply, such as the GAMDIAS logo, are covered by a plastic seal to prevent any scratches. Otherwise, a GAMDIAS branded Velcro bag is also included, which contains all the cables, zip ties, and some mounting screws for the power supply. Interestingly enough, no manual or documentation is provided. As mentioned on the front of the box, a full ten years of warranty is provided with this power supply, which is pretty good. posted 5 hours and 33 minutes ago, with 12 posts. posted 5 hours and 33 minutes ago, with 9 posts. posted 5 hours and 34 minutes ago, with 3 posts. posted 5 hours and 36 minutes ago, with 4 posts. posted 5 hours and 37 minutes ago, with 11 posts. posted 5 hours and 38 minutes ago, with 56 posts. posted 5 hours and 38 minutes ago, with 11 posts.